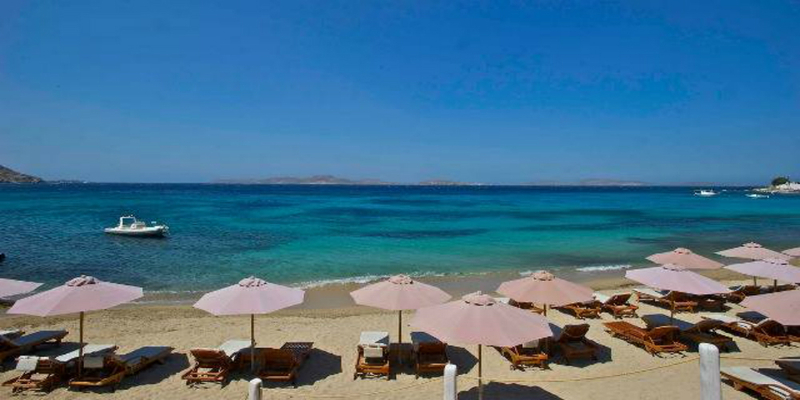 Agios Ioannis beach is located on the southwest of Mykonos Island, in a 5 km distance from Mykonos town. It is considered one of the most beautiful beaches on the island and furthermore is well protected from the wind which can be quite strong on the peak season. The beach has soft, gold sand and crystal clear blue waters. Although it is an organised beach, it’s only on the peak season that gets crowded. There are two beach bars, plenty of restaurants and a variety of hotels around the beach. Agios Ioannis is definitely a family friendly beach and also attracts people that don’t like to draw attention. The sunset view and the view of Delos, are for sure its strong assets. At the end of September the most popular festival of the island takes place at the area of Agios Ioannis. This beach is strongly recommended to those who seek relaxation and calmness. But if you prefer an even more quitter beach, then try Kapari, a virgin and unspoil beach very close to Agios Ioannis.